The tree was in decline and posed a safety hazard due to its potential to fall. According to Warren Roberts, Superintendent Emeritus of the Arboretum, the pinecones were also a concern; if a pinecone were to fall from that height it would do as much damage as a bowling ball! 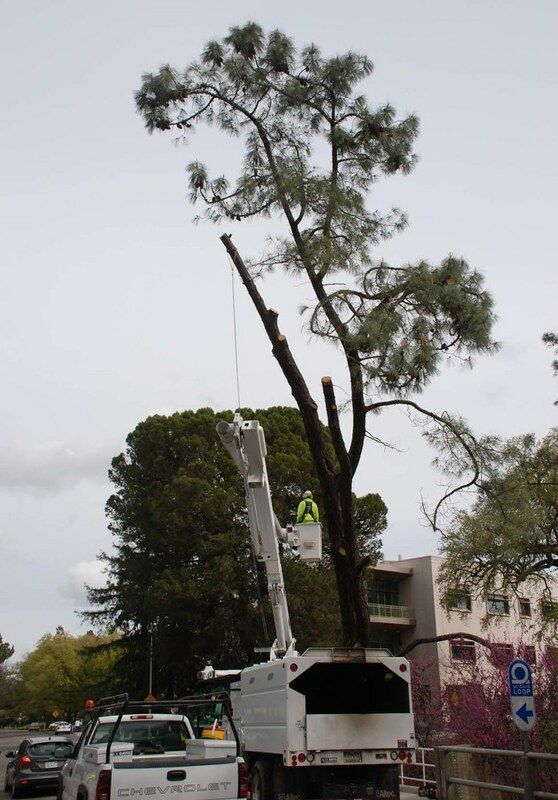 Thanks to Grounds and Landscape services for removing the tree and demonstrating how our integrated teams work together to improve the health and safety of our campus’s urban forest. Staff from Grounds and Landscape Services frequently collaborate with Dr. Harding and his students on projects from large tree removals to pruning demonstrations. These photos will be used as an instructional tool for his students.